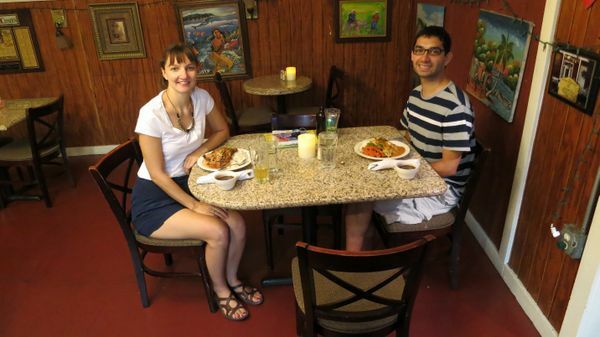 Daraius and I went to a Caribbean restaurant for dinner called Mo’s. Out of all the restaurants we tried, this was my favorite! 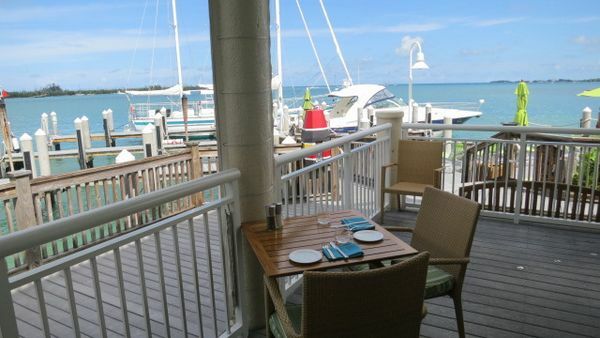 However, it is is ~1.5 miles from the Hyatt Key West, so you may have to drive or bike there. 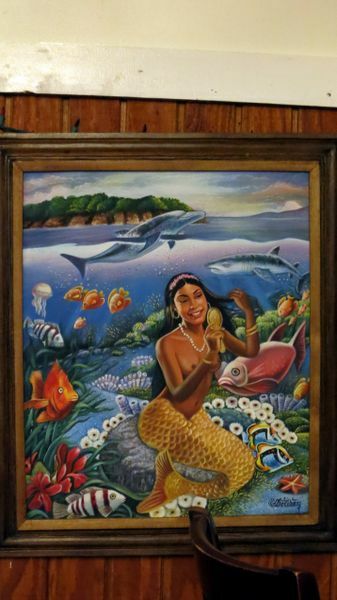 The restaurant had Caribbean art on the walls. 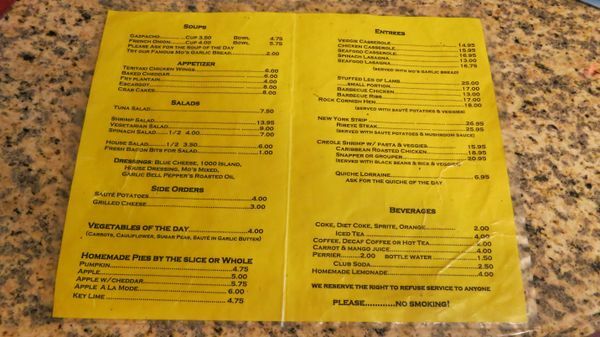 They had a full menu with a decent selection of Caribbean food. The menu was only 2 pages, but everything looked so good, I had trouble deciding! Appetizers were from $5 to $8 and main courses were from $15 to $20. This was our splurge dinner for the trip. 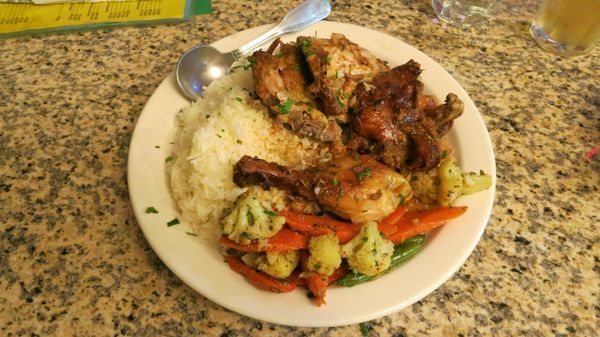 I ordered Jamaican baked chicken with rice and veggies. 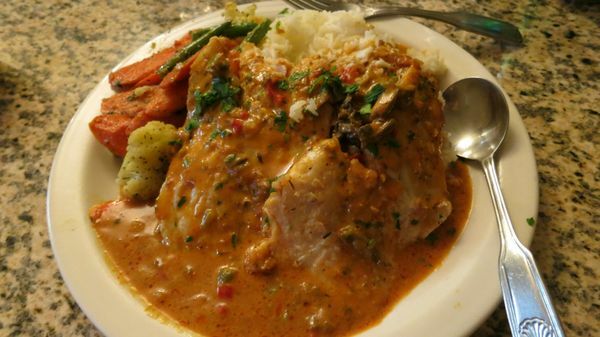 Daraius had spicy red snapper also with rice and veggies. The food was delicious!! I loved it so much. The chicken was so tender, it fell right off the bone. It was as smooth as butter, and so flavorful. 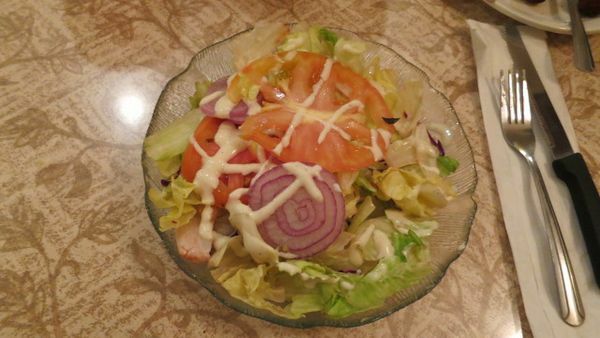 The vegetables were very fresh, and were cooked in a buttery parsley sauce. They went very well with the rice and chicken. 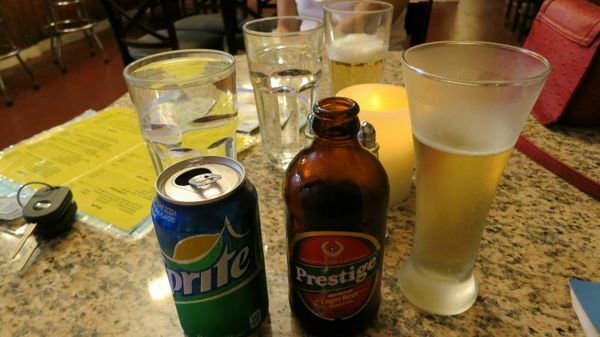 To drink, we shared a shandy, which is beer mixed with Sprite. We were too full to order dessert, but when we got the check, we also received a free slice of key lime pie. It was served on a graham cracker crust and was also very good. 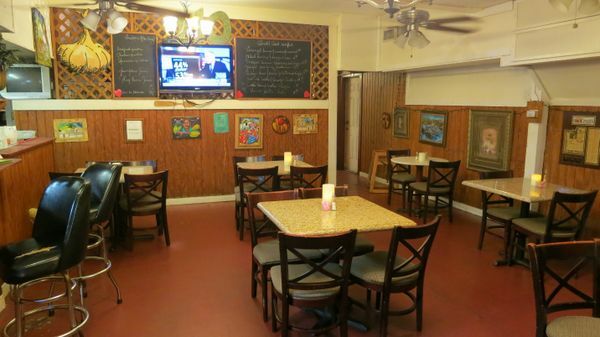 The owner and his wife run the restaurant and do everything from cooking to serving! I wanted to visit Mo’s again before we left, but never got a chance. 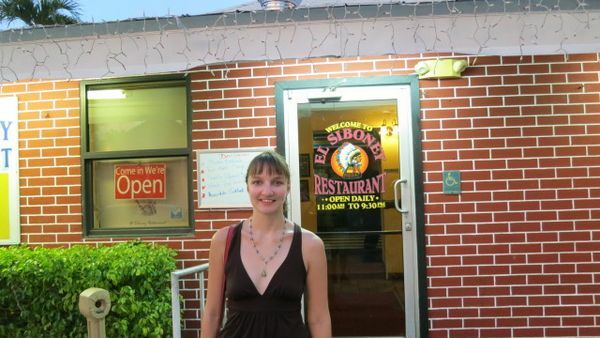 For dinner the next evening, we went to El Siboney, a Cuban restaurant. 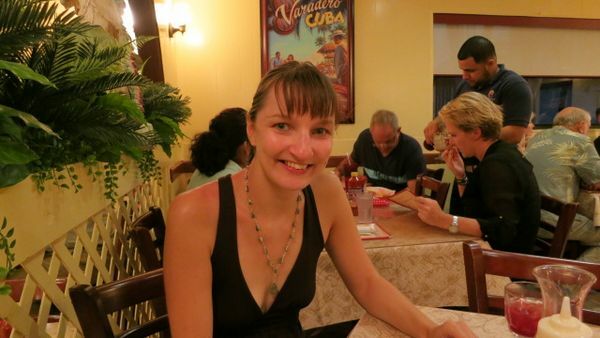 They specialized in Cuban food. 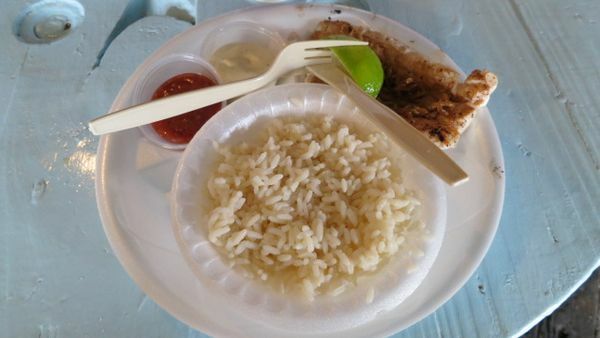 Daraius ordered red snapper with yellow rice and plantains. 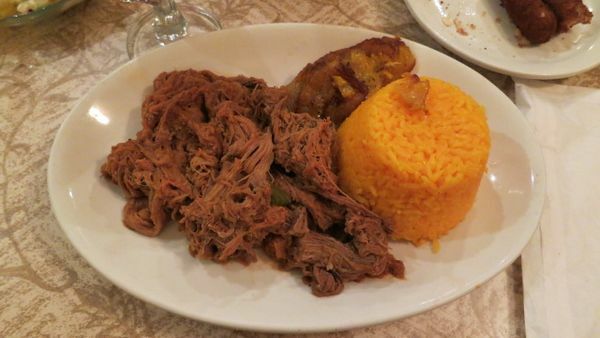 I had ropa vieja, which is shredded beef in a spiced tomato sauce. 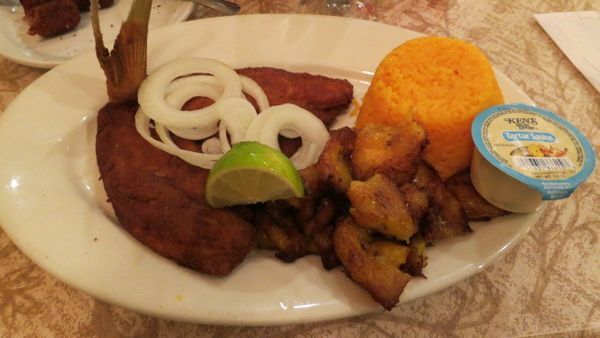 Our entrees included yellow rice, plantains, and a salad. Daraius also had ham croquettes. 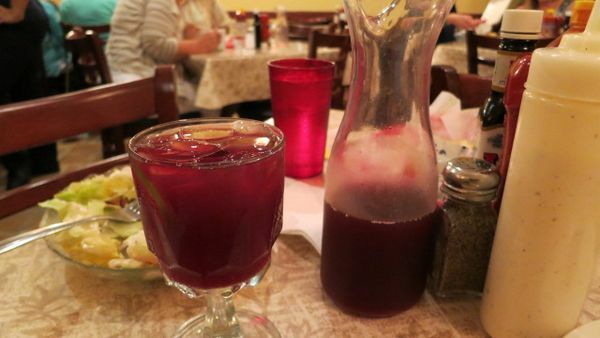 To drink, we split a pitcher of sangria. The food was okay—not something I would return for, unlike Mo’s, but it was nice to try. 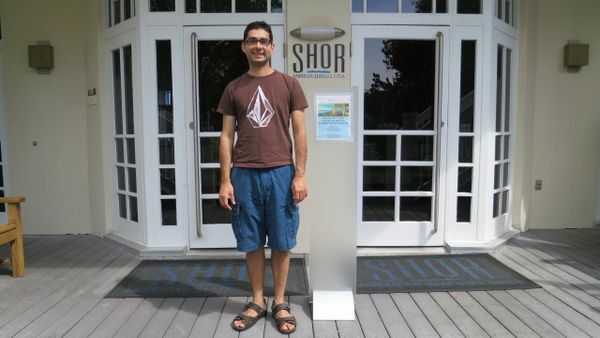 Daraius and I had breakfast at the Shor Restaurant at the Hyatt. Daraius is a Hyatt Diamond member so we could order an entree, sides (toast, bacon, ham etc.) and drinks. 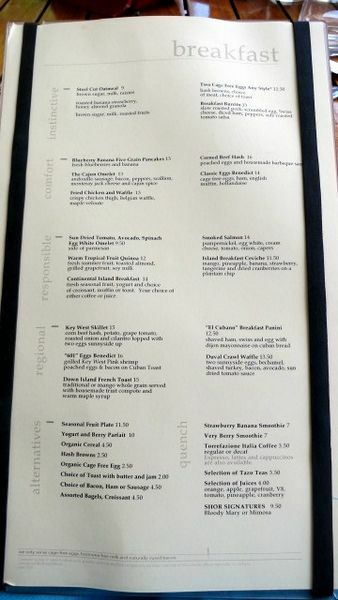 Here’s the breakfast menu. 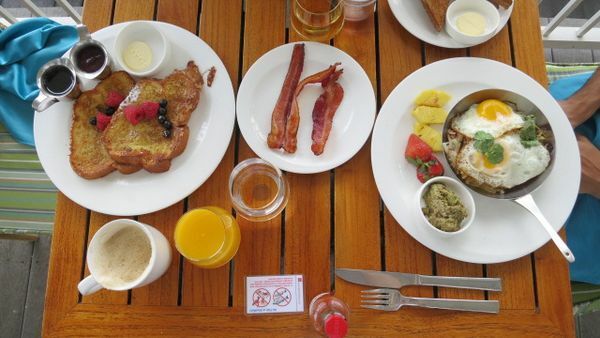 We would eat a late breakfast so that we could either skip lunch or have a small lunch and save money. 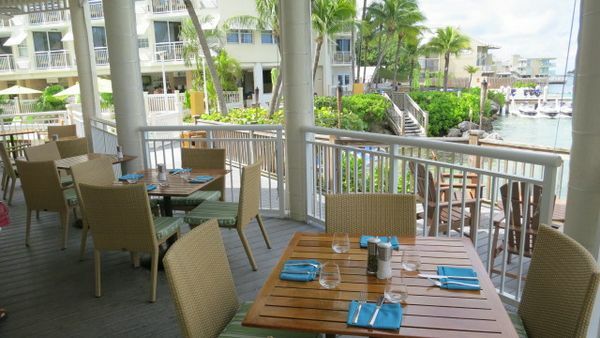 The restaurant is just a few minutes walk from the rooms, and just steps away from the pool. It has a wonderful view of the water. There were many seats with good views. They had many American favorites and a couple of Caribbean inspired selections. 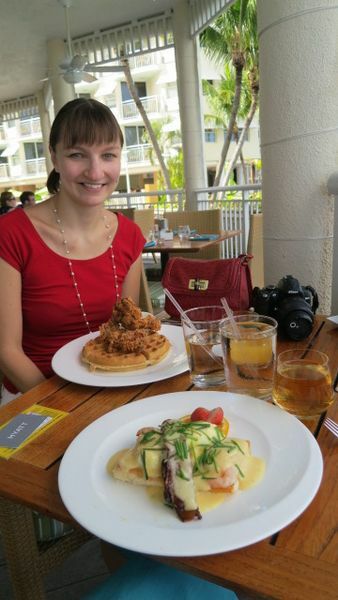 I ordered the fried chicken and waffle, a first for me for breakfast! 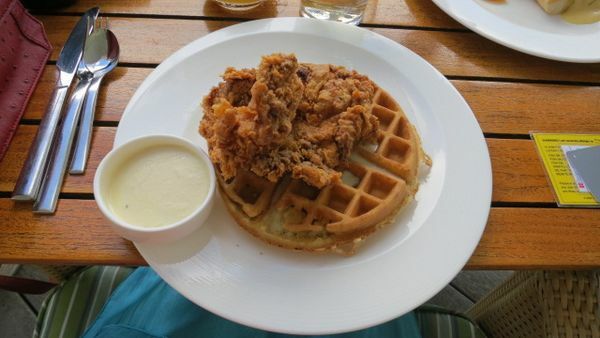 It came with a fried chicken thigh, a waffle, and buttermilk gravy. It was actually really delicious, but I felt guilty about having fried chicken for breakfast! Daraius had eggs benedict with apple juice. Everything in moderation though, right? The next morning we chose somewhat healthier options from the menu We had French toast, bacon, and the Key West Skillet with corn beef hash, potato, cilantro and eggs. Daraius loved it! 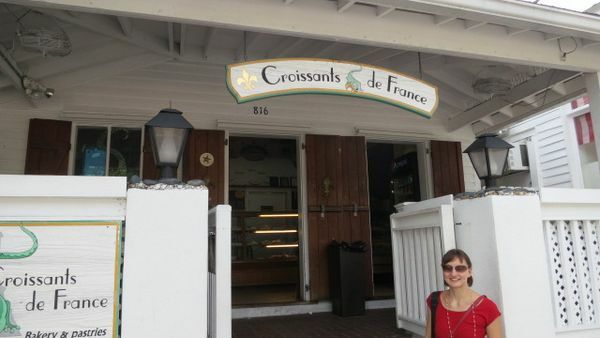 For lunch, we went to Croissants de France (on Duval Street), a French café, for crepes but they were renovating their kitchen. So, we were limited to cold quiches and pastries. 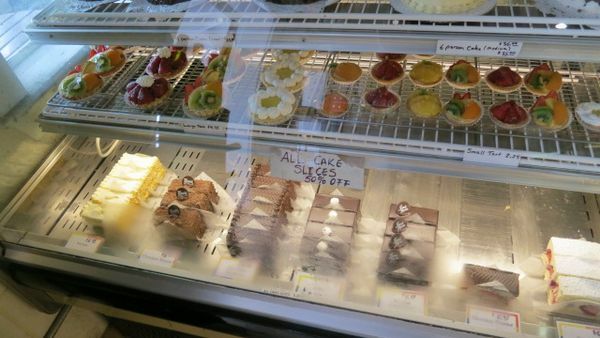 The do sell some cakes for 50% off if they are unsold, so that could be a cheap sweet treat! But they had a lot of choices and it was hard to pick. 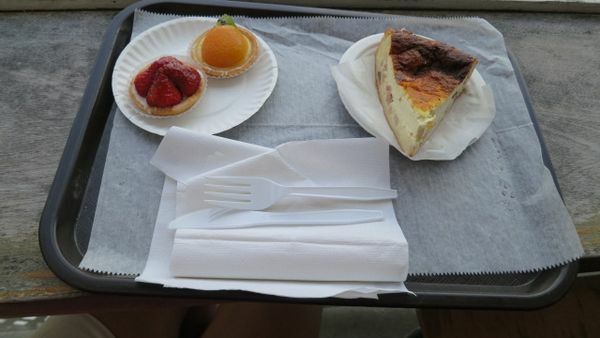 I ordered a quiche Lorraine, and Daraius had two small fruit tarts, strawberry and apricot. I think I liked the apricot one the best! 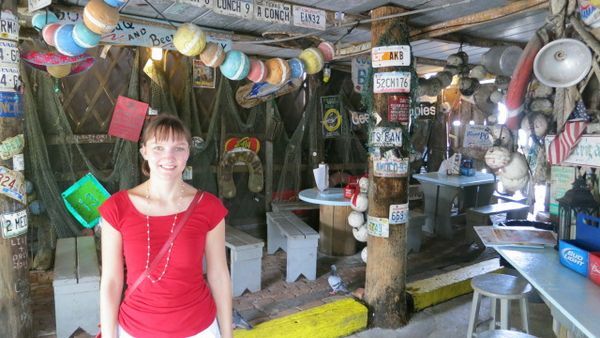 We sat out on Duval Street and enjoyed the people watching. That evening Daraius was in the mood for fish, so we went to BO’s Fish Wagon. BO’s Fish Wagon is just 5 minutes walk from the Hyatt. 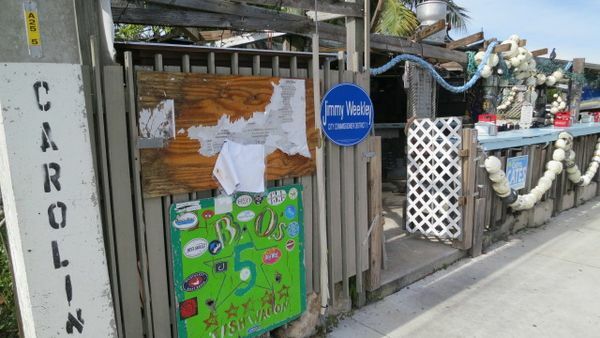 The restaurant had a very distinct Key West style of anything-goes décor. 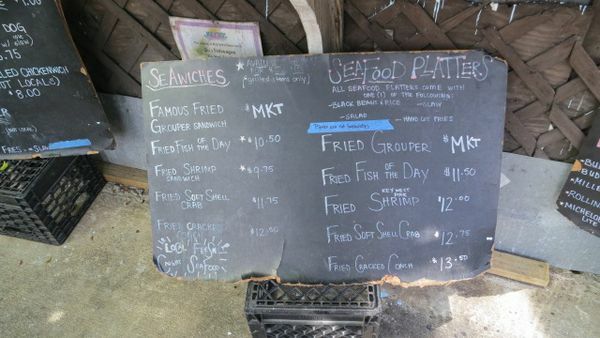 The menu was written on huge pieces of chalkboard. I didn’t order anything because of my fish allergy, but Daraius ordered a fish with rice and loved it! He wanted to order another one, but stopped himself. 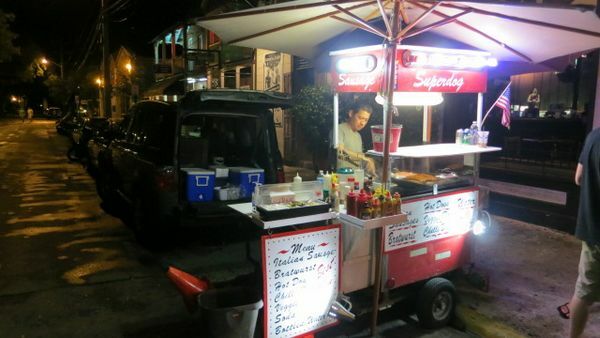 Daraius had a hot dog from the Superdog card on Duval Street. He said that it was cheap and tasty and wanted to have a 2nd hot dog! I didn’t want a hot dog, so we went to BurgerFi on Duval Street. 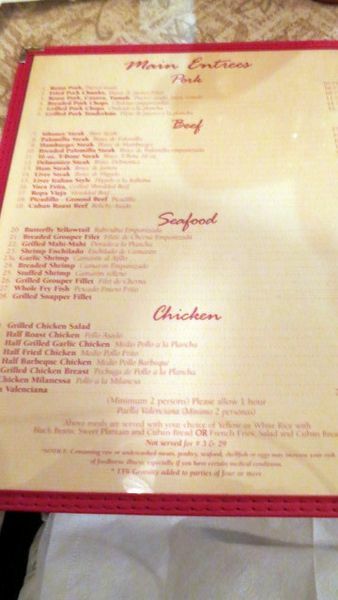 The menu was huge! 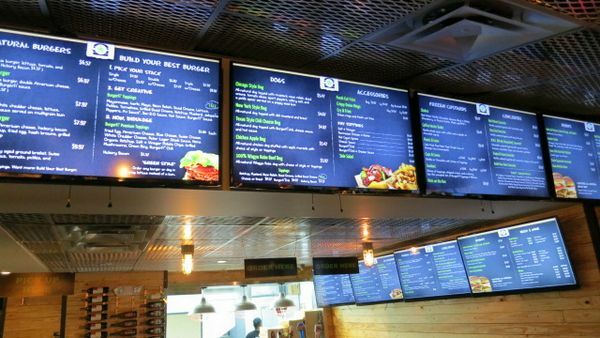 You could order anything from burgers, hot dogs, accessories, frozen drinks, beer and wine! I ordered a cheeseburger and fries topped with parmesan cheese and herbs. 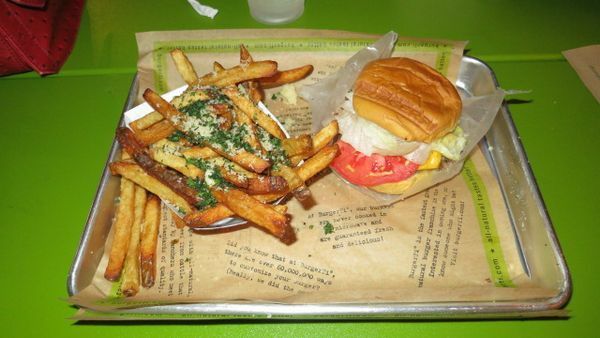 I loved the burger, but the fries could have been better. @Oh no! – We’ll try that next time! @Diana – I don’t like carrying a heavier camera, but thanks for your tips. I’ll readily admit that I’m not the best photographer! 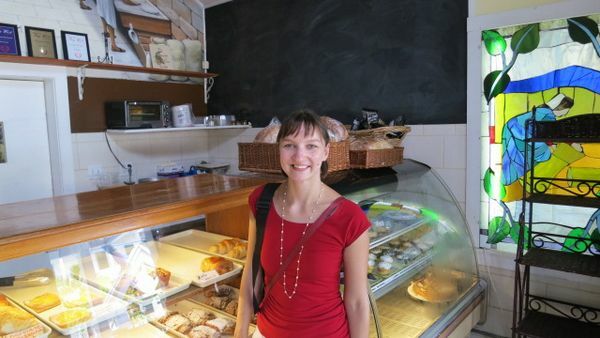 @dotti cahill – We’re very lucky! 7:15 pmNovember 22, 2013 Oh no! You should have stopped at Latitudes!!! And.. 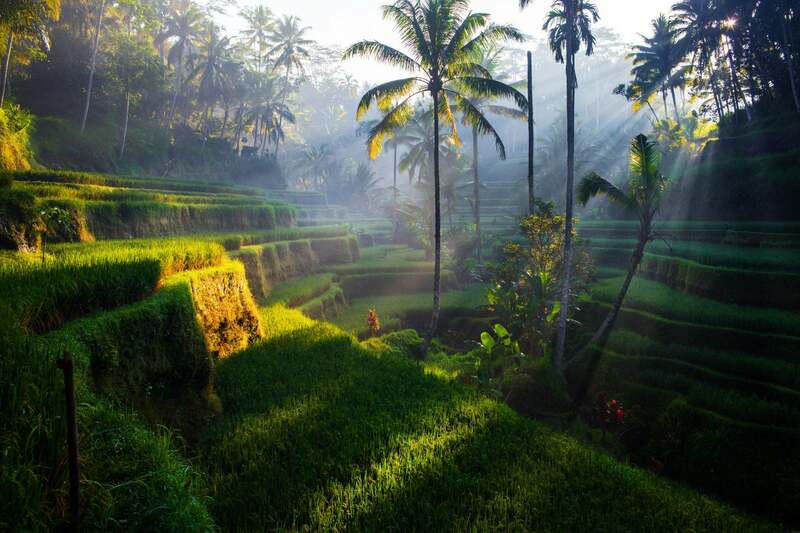 I did book using 22,000 per night, had to, for 3 nights. I might revisit the site and see if there was a missed opportunity to save some on some of those points. 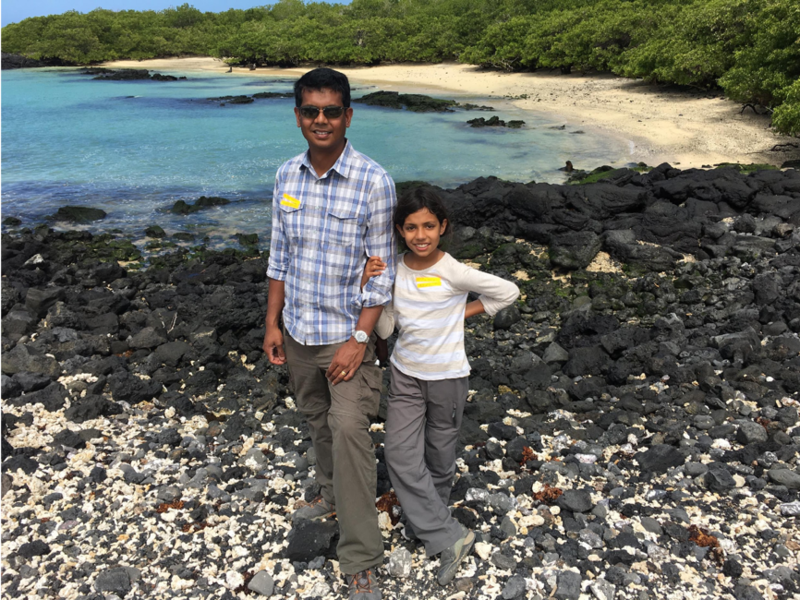 Good thing is on SWA we’re not paying for my wife to fly with me… bit o’ trade off. 3 days in High Season in KY for taxes and beer / food money, ain’t bad!